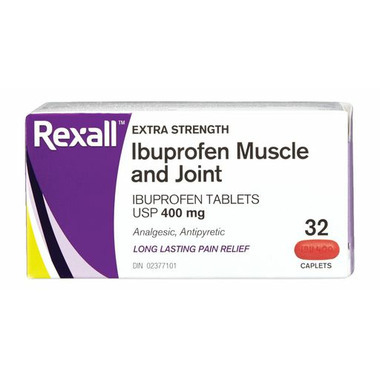 Rexall Ibuprofen Muscle & Joint Ibuprofen Tablets are analgesic, antipyretic, and provide long lasting pain relief. Dosage: Adults and Children over 12 years of age: 1 caplet every 4 to 6 hours to a maximum daily dose of 3 caplets. Consult a doctor if pain persists for more than 5 days or fever more than 3 days. Children less than 12 years of age: Consult a doctor. Do not exceed recommended dose except on the advice of a doctor or dentist.